Reflection is an interesting word with many meanings. To a philosopher it means careful or considerable thought on a subject. To an anatomist it means a structure that bends back along the path it came from. To a narcissist it’s their image in a mirror. To a photographer it usually means subjects mirrored in water, ice, or glass. But to a lens designer (or just a gearhead) it refers to light that bounces off of the glass elements in a lens rather than refracting properly to form an image on the sensor. It’s this meaning that I’m reflecting on today. Most people don’t think about how huge a problem this is in lens design and what enormous effects it can have. What’s the Big Deal with a Little Reflection? I spend way too much time researching the history of camera and lens development. If you do that you notice there were two huge gaps where nothing seemed to happen. The first began in the 1860s and lasted until the 1890s. Everything was limited by the glass available and nothing much happened until Abbe and Schott developed and categorized different types of optical glass. A huge burst of new lenses followed, but then things quieted down again until the late 1930s. Why? Because the reflections that occurred at every air-glass interface meant that lenses could only contain a few elements that weren’t cemented together. We’d still be shooting with the same type of lenses available in 1910 if it weren’t for the development of the most important few molecules in your camera lens: the anti-reflective coatings. I’ve written three articles on the development of cameras, eight on the development of various lens types, but not a word about coatings. So here it is, my overdue ode to the most important couple of microns in every lens you own: the anti-reflective coatings. If you’ve read any of my “History of Lens Development” articles you may have noticed the early lenses usually had just a few (4 to 6) elements. This wasn’t because the early designers weren’t capable of calculating more complex designs, or the lensmakers of building them. It was because every lens element (other than those cemented together) reduced the amount of light transmitted through the lens by 4 to 8%, the rest was scattered by reflection. The reflected light caused flare, ghosting, and reduced contrast in the image. The uncoated glass in my 1880 vintage Petzval Portrait lens reflects rather dramatically. In the early 1900s every photographer knew that more glass elements in a lens usually meant better control of aberrations and increased resolution. It also always meant lower contrast in an image because of all the light reflection occurring at each air-glass interface. In the late 1890s, though, two people noticed a way to lower the amount of reflection in an image. Lord Rayleigh (of the Rayleigh Criteria) and Dennis Taylor (famed designer of the Cooke Triplet lens) both noticed that older, tarnished lenses transmitted more light (and reflected less light) than brand new shiny lenses. Rayleigh, being a scientist, did his research and discovered how the tarnish reduced reflection. (In reality, Fresnel had already described mathematically why this would happen in 1818.) Taylor being a lens designer, developed and patented techniques using chemical baths to tarnish lenses on purpose in 1904. Neither event mattered much: Rayleigh moved on to other things like discovering Argon and Taylor never developed a practical, reproducible method for tarnishing lens elements. In 1935, however, Alexander Smakula, an employee at Zeiss AG, developed and patented a relatively simple process for placing an anti-reflective coating on lens elements. This remained a military secret through most of World War II but is the major reason Allied forces coveted binoculars taken from German prisoners: they were far better than anything the Allies could make. This simple coating could reduce up to 80% of the light reflection from each glass element. Later coatings improved enough to allow 90% light transmission by the 1960s, 99% by the 1990s, and even more today. Bored yet? Don’t be. Let’s take a look at just how much of a difference that simple coating makes. 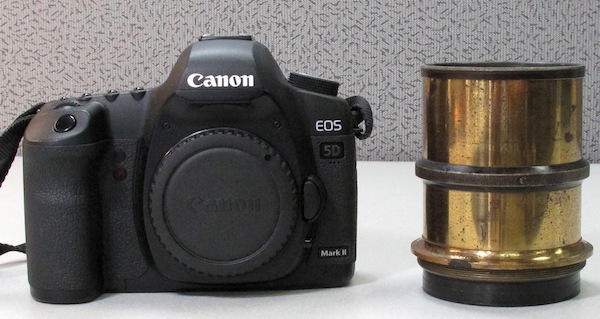 Below are diagrams of a relatively simple lens on the left and complex zoom lens on the right. The simple lens has 12 air-to-glass interfaces, the complex lens has 32. Without coatings each interface would reflect about 4% of the light that reaches it. For the simple lens, 38% of all the light entering the simple lens would be absorbed or scattered before exiting the rear element if there were no coatings. For the complex lens around 70% of the light would be affected. If we just put a simple, 1935-era coating on each element (reducing reflection at each surface from 4% to 1%) we reduce light reflection to 12% for the simple lens and 27% for the complex. Use a modern coating that is 99.9% effective, and total reflection changes to less than 2% for the simple lens and just over 3% for the complex lens. So, yeah, it’s important. Without coatings there would be no zoom lenses (too many elements) and even most prime lenses would have more simplified structures leading to significant compromises in image quality. So How do Coatings Work? It’s pretty simple to explain if you have a Ph. D. in optical physics and speak higher order mathematics. I don’t, so I’ll just have to explain it to you like it was explained to me (and I’ll put some references at the end of the article for those of you who want to double check the Trig and Calculus formulas). Basically, though, there are three types of coatings, each working in a different way. The first two types can be combined with each other to improve their effectiveness; the third type (nanocoating) is so effective it doesn’t need any help. The simplest (and first) coatings worked by reducing the difference in refractive index between air and glass. Lenses work by bending light (or slowing it, which really is the same thing) as it moves from the air to the glass. 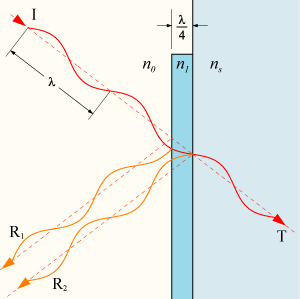 At each such interface, some of the light is reflected and the amount of reflection is proportional to the SQUARE of the difference in refraction. Air has a refractive index of about 1.0 and optical glass of 1.5 or more. That difference causes about 4% of the light to be reflected at each surface of the lens. If we put a coating of a material that is half as refractive as glass on the element we double the interfaces where light would reflect (since light now changes at air-coating and coating-glass interfaces instead of just air-glass). BUT at each interface only 1/4 as much light would be reflected (the amount of reflection is the square of the difference in refractive index). The end result is that total reflection is half of what it would be with no coating. 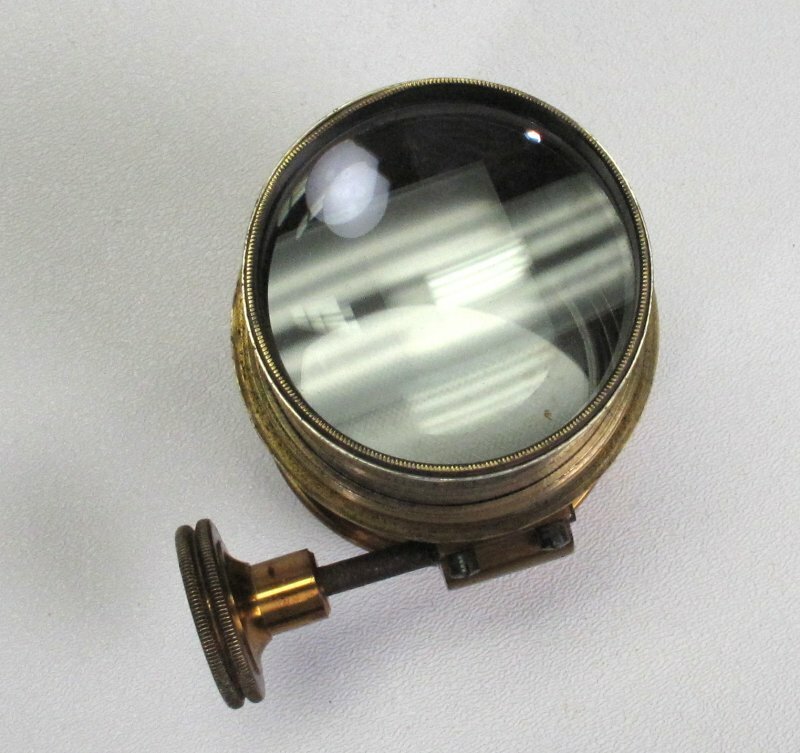 The tarnish coatings that Rayleigh and Taylor observed, and the first Zeiss optical coatings worked because they had a refractive index between that of air and glass. The ideal coating substance would have a refractive index of around 1.25, but unfortunately there’s no coating chemical available with quite that index. The most commonly used coatings are magnesium fluoride (which has a refractive index of 1.38) because it’s relatively cheap, easy to apply, and gives a hard scratch resistant surface. 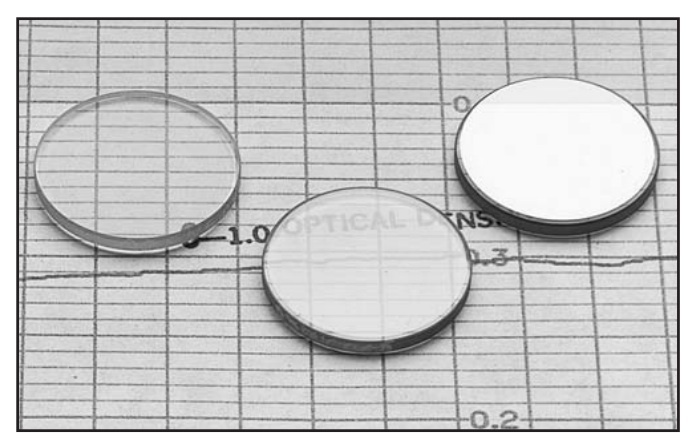 Fluoropolymers (like Teflon) have a better refractive index (1.30) but are more expensive and difficult to apply. A second effect is obtained when coatings are very thin layers, only as thick as 1/4 of the wavelength of light. Remember that light is reflected from both the front and back surfaces of a layer. If the layer is 1/4 of the wavelength of light thick, then light reflecting from the back surface will travel 1/2 of a wavelength further than light reflected from the front surface (1/4 wavelength to the back surface, another 1/4 back to the front surface). Unfortunately, light is not made up of just one wavelength, so the interference effect (also known as the thin-layer effect or quarter-wavelength coating) can only reduce reflection for one part of the spectrum. But if we apply more layers of coatings of slightly different thicknesses then an interference effect at several different wavelengths will occur, reducing reflection throughout the entire spectrum of visible light (or infrared or ultraviolet – there are coatings specially made for work in those regions). In theory, at least, we could also use coatings of different refractive index, creating a refractive index gradient so there is no sudden change in refraction (or really several small steps rather than one large change). Additionally, since coatings that are 3/4, 5/4, etc. of a wavelength thick can also cause destructive interference, several layers of coatings may give additional benefits. At this point those simple coatings should be sounding pretty complex, because they are. Designing a multilayer coat requires computers crunching mathematical formulas for the effect of each layer, the effect each layer has on every other layer, effects at different wavelengths of light, effects of different angles of incidence of the light rays on the coatings, etc. The coating designs, application methods, etc. are proprietary and differ slightly from manufacturer to manufacturer. You may think nanocoatings are brand new but actually they’ve been around for about a billion years on moths’ eyes. Moths’ eyes are unique in that they don’t reflect any light, making the moth less visible to predators at night. The reason they don’t reflect light is that they are covered with a pattern of bumps about 200 nm (nanometers, hence the nanopart) high. Since 200nm is smaller than the wavelength of visible light, the light rays don’t reflect as they enter the moth’s eye. Those brand new nanocoatings you’re reading about are simply humans copying nature. Nanocoatings are almost certainly better than the best multilayer coatings, although it’s difficult to say be how much better. It would seem certain they reduce reflection to less than 0.1%. They also are apparently nearly as effective when light hits the surface at oblique angles, a situation in which layered coatings loose some of their effectiveness. The takeaway message is simple. Even a single-layer, inexpensive coating on your lens or filter reduces reflection from about 4% to about 1.5%. A good (and relatively expensive) multilayer coating can reduce it from 4% to as little as 0.2%. You don’t generally get to choose what coatings have been placed on the elements of your new lens, but you do get to make the choice when it comes to filters: the cheapest aren’t coated at all, some have a single coating on one side, the vast majority of even lower priced filters have single coatings on each side, the best have multiple coatings on both sides. All broadband multilayer coatings work very well, much better than any single layer coating could. The only difference you might notice is when you look at an element at a steep angle: you can often note a color tint that isn’t visible looking directly through the lens. These slight differences are why one manufacturer’s lenses may seem a bit “warmer” or “cooler” than another’s. If you have lenses of different brands try looking at the front element under angled light – you may see any tint from yellow to orange to purple, but the color will vanish when you look straight through the lens. The bad news about coatings is that you can’t fix or repair them (at least not at home) when they become damaged. Coatings are complex things applied in a vacuum by industrial techniques with names like Hard Ion Beam Sputter and Advanced Plasma Reactive Sputtering. Not the kind of equipment most of us keep around the house. Most coatings are durable and hardened, however, and not much more likely to be damaged than the glass they cover. Without coatings, though, modern lenses could simply not exist: we’d be back to trying to use lenses with 3 or 4 elements, maybe 6 if we’re willing to sacrifice some contrast. So next time you pull out your 1.5 kilogram, 23 element zoom lens say a little thank you to the milligram or so of coatings that let you actually see through it.